BAYFIELD – A group of more than 100 family members, friends and neighbors said “goodbye” to Dylan Redwine Saturday night in a candlelight vigil at Eagle Park in Bayfield. “Even people who never met Dylan came to love him,” said the Rev. Dan Straw of Florida Mesa Presbyterian Church. “We are grieving, and much of the world is grieving,” he said. 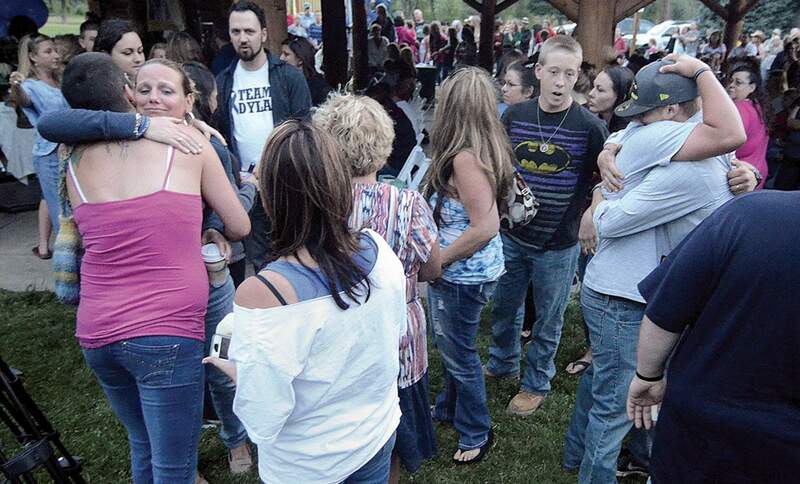 Many of the mourners in the park had in one way or another helped in the search for Dylan after he was reported missing Nov. 19, 2012, from his father’s home in Vallecito. Some of the teenager’s remains were discovered last week on Middle Mountain about eight to 10 miles from Mark Redwine’s home, where he was last seen. The Colorado Bureau of Investigation confirmed the remains were Dylan’s. Bayfield was the center of search efforts for the then-13-year-old who disappeared from his father’s home during a court-ordered visit. Dylan’s older brother, Cory, said he had so many memories of him he didn’t know how he could focus on one. He recounted a trip they took to Ohio to visit the Pro Football Hall of Fame in Canton. Cory Redwine first talked about how Dylan had tried to tell him they may have missed their turnoff when they passed signs indicating they were getting close to Michigan. Then, when they finally made it to the Hall of Fame, Dylan ran ahead and then back to Cory and asked him if he knew the meaning of terms like “gridiron.” Dylan explained the terms to his older brother until Cory realized Dylan was reading the exhibits and reciting the information back to him. “He was an ... amazing person,” Cory said. “We came here to celebrate Dylan and the wonderful and beautiful boy that he was,” family friend Denise Hess said. Before the vigil, Mark Redwine said he met with law enforcement Saturday and went with them up to Middle Mountain to the area where they found some of Dylan’s remains. “It was horrific. It was unimaginable,” Redwine said. “No parent should go up there” in a situation like this, he said. Yet, it also shows how a community can come together, said Bayfield resident Diane Estes. “Clearly, in a low population area, everybody feels impacted when this happens, especially to a child,” she said. Wesley Herring, part of Dylan’s close group of friends, helped collect river rocks for people at the ceremony to sign. The rocks will be given to Elaine Redwine for a memorial at her home near Colorado Springs, he said. 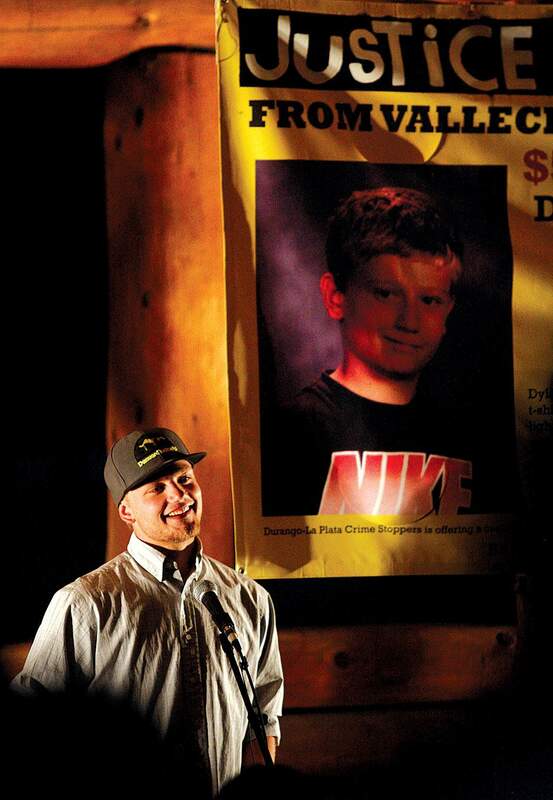 Dylan Redwine’s brother, Cory, shared numerous stories about his younger brother during a vigil Saturday night in Bayfield. Cory said he could not think of one favorite story because they all had equal meaning and importance to him. A tip line remains in place with the La Plata County Sheriff’s Office to collect information about Dylan’s disappearance. The line is not answered but collects messages and is checked frequently by investigators. Anonymous tips may also be left with Durango-La Plata Crime Stoppers at 247-1112. Friends and supporters waited in line to hug Elaine Redwine, left, and Cory Redwine, right, during a vigil held for Dylan Redwine on Saturday evening in Bayfield. 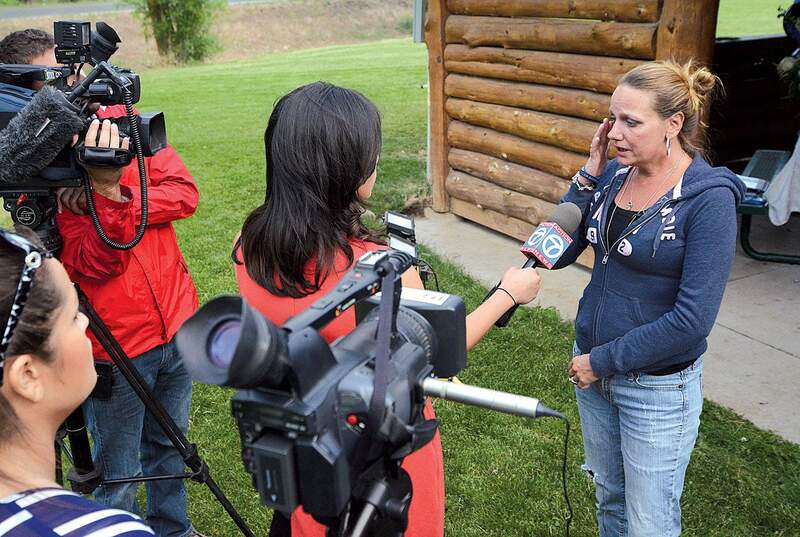 Elaine Redwine spoke with the media before a vigil held for her son Dylan Redwine on Saturday evening in Bayfield. Since the teenager went missing in November, the story has gained national attention, including an appearance by his parents on the Dr. Phil show.